OhGizmo Review Preview: Dragonlasers 250mW Spartan | OhGizmo! 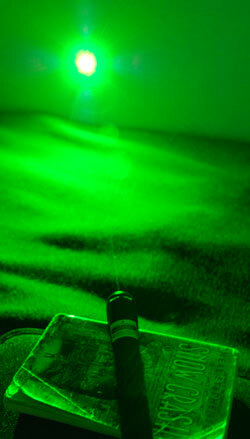 Back in October, I did a long review of Dragonlasers’ Hulk 250mW green laser. I guess it must have impressed someone over there, because I just got another test model in the mail… A different 250mW green laser called the Spartan. The biggest differences are the size (much smaller) and the fact that it uses rechargeable lithium batteries (yay!). The Spartan laser is approximately the same power as the Hulk that I’ve already reviewed, so as far as burning stuff, you won’t be seeing any new lightsaber slice ‘n dice.. But that in no way means that I won’t be able to come up with some cool tricks for this review. I was hoping, though, that you guys might be able to post some suggestions as to what I should do with this thing, based on what you saw and liked about some of our previous laser reviews. As before, I won’t be doing anything dangerous, expensive, catchably illegal, immoral, dumb, or boring. 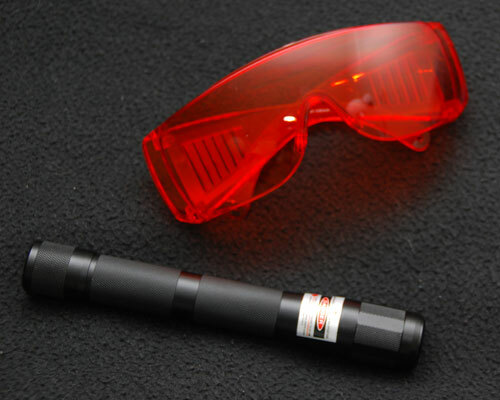 And I will be wearing serious eye protection, since Dragonlasers was kind enough to include some badass anti-laser goggles. That said… I’ll be having some fun, too. Legal, safe fun, of course. Of course. i have a pretty bright green laser pointer, and one thing i’ve always wanted to do is to measure the spot size that occurs from beam divergence…but like from a mile away. i haven’t done it myself with mine, because a) i haven’t found a line of sight, 1 mile area b) i have no friends to help me, or who would want to help me, haha. try to burn (cook?) different types of meat or other random foods around your house. like a cracker, hotdog, small pile of brown sugar, etc. You should set up a series of mirros (Like in the movie w/Val Kilmer Real Genius) and see if you can redirect the beam and either change it’s size, or just shoot it around corners etc. Set your sights on the hubble.. use the satellite finder on NASA’s pages to locate it… or beg/borrow a high end home users telescope set up the laser at the eye piece and draw a smilly face on the moon. May need some friends to sync up with draw at the same time.